I wanted to use the TwitteR package for R since a long time, I tried but didn’t do much of it. Today I found a few minutes, followed simple recipes (I admit), and looked at the number of tweets about flu today (November 13, 2018). Result: 283 tweets in English (I wanted to focus on the USA but, for some reason, I couldn’t … yet!). That’s not a lot. But remember we are only at the beginning of the influenza season 2018-2019 in the Northern hemisphere. After some very basic cleaning, here are the words most used: flu, influenza (obviously: I was looking for them! ), rt (note to self: remove this indication of a retweet), vaccine, health and get. As I mentioned: we are at the beginning of the flu season in the Northern hemisphere, it’s still time to get vaccinated and protected against flu! It’s basically the same graph as above. You don’t get the count but you get the feeling of how important each word is (and you get more words). After a bit less than 2 hours, jepsfitbitapp retrieved my sleep data from Fitbit for the whole 2013 (read previous post for the why (*)). 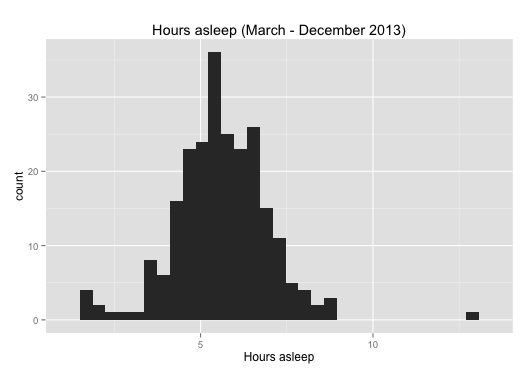 Since this dataset covers the period I didn’t have a tracking device and, more broadly, I always slept at least a little bit at night, I removed all data point where it indicates I didn’t sleep. So I slept 5 hours and 37 minutes on average in 2013 with one very short night of 92 minutes and one very nice night of 12 hours and 44 minutes. Fitbits devices do not detect when you go to sleep and when you wake up: you have to tell tem (for instance by tapping 5 times on the Flex) that you go to sleep or you wake up (by the way this is a very clever way to use the Flex that has no button). Once told you are in bed the Flex manages to determine the number of minutes to fall asleep, after wakeup, asleep, awake, … The duration mentioned here is the real duration the Fitbit device considers I sleep (variable minutesAsleep). 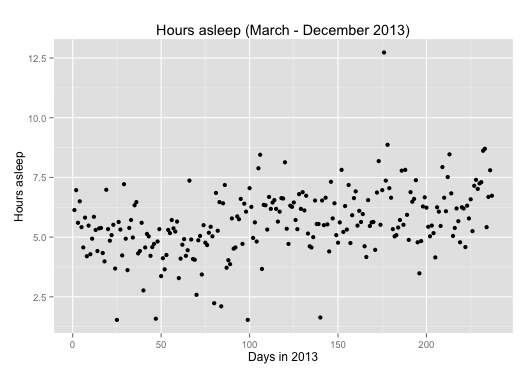 Visually it looks like there is a tendency to sleep more as 2013 passes. But, although the best linear fit shows an angle, the difference between sleep in March and sleep in December is not significant. R allows to study the data in many different ways (of course!). 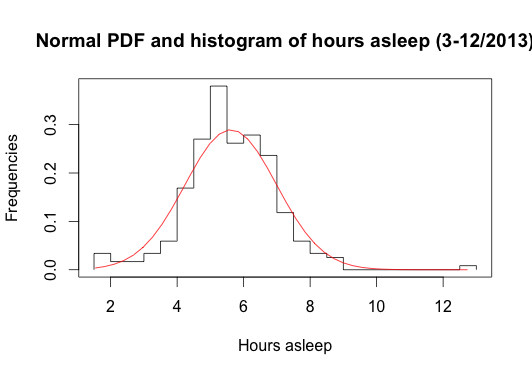 When plotting the distribution of durations asleep it seems this may be distributed like a normal (Gaussian) distribution (see the graph below). But the Shapiro-wilk normality test shows that the data doesn’t belong to a normal distribution. As mentioned above, Fitbit devices are tracking other sleep parameters. 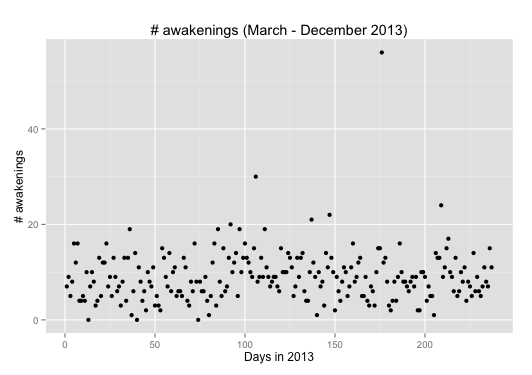 Among them there is the number of awakenings and the sleep efficiency. 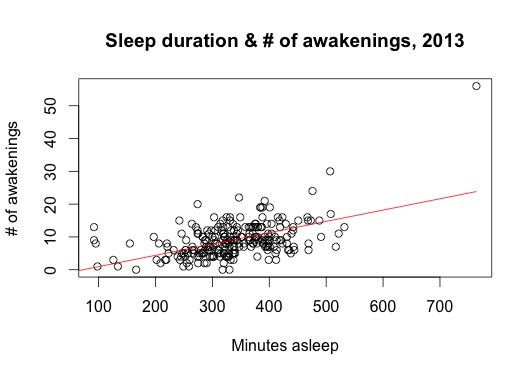 The simple plot of the number of awakenings over time shows the same non-significant trend as the sleep duration (above). 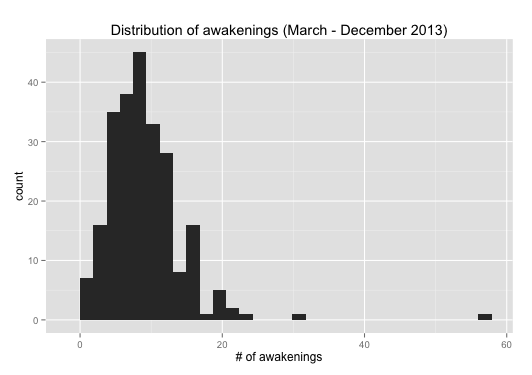 The histogram of these awakenings shows a more skewed distribution to the left (to a low number of awakenings) (than the sleep duration). This however shows there is a relation between the two variables: the more I sleep the more the Flex detects awakenings (see second graph below). … or very low. There are indeed some nights where my sleep efficiency is below 10% (see the 4 points at the bottom of the chart). These correspond with nights when I didn’t sleep a lot and also with very little awakenings (since these are related). The code is updated on Github (this post is in the sleep.R file). (*) Note: I just discovered that there is in fact a specific call in the API for time series … This is for a next post! Previous data belong to the “activities” category. In this category it is easy to get data about a specific activity over several days in one request. All parameters related to sleep are not in the same category and I couldn’t find a way to get all the sleep durations (for instance) in one query (*). So I updated the code to requests all sleep parameters for each and every day of 2013 … and I hit the limit of 150 requests per hours. This graph is what I achieved so far. 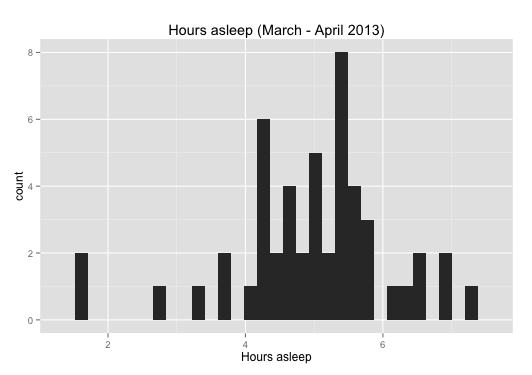 I didn’t sleep much in March-April 2013: on average 4.9 hours per night. The interesting thing is that I can understand why by going back to my agenda at that time (work, study, family …). As soon as I can get additional data it would be interesting to see if sleep durations will increase later on. 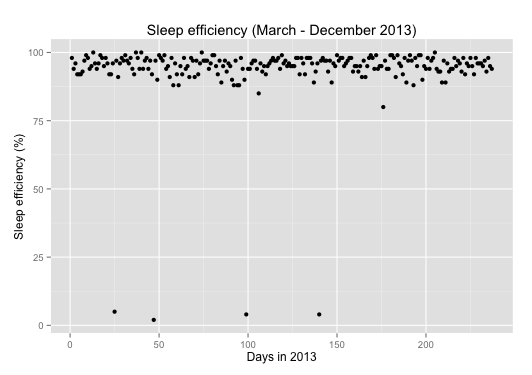 (*) If you know how to get all sleep durations for 2013 in one query, let me know! 2013 is near its end and it’s time to see what happened during the last 360 days or so. Many things happened (graduated from MBA, new house, holidays, ill a few days, …) but I wanted to know if one could quantify these changes and how these changes would impact my daily physical activity. For that purpose I bought a Fitbit One in March 2013. I chose Fitbit over other devices available because of the price (99 USD at the time) and because it was available in Europe (via a Dutch vendor). 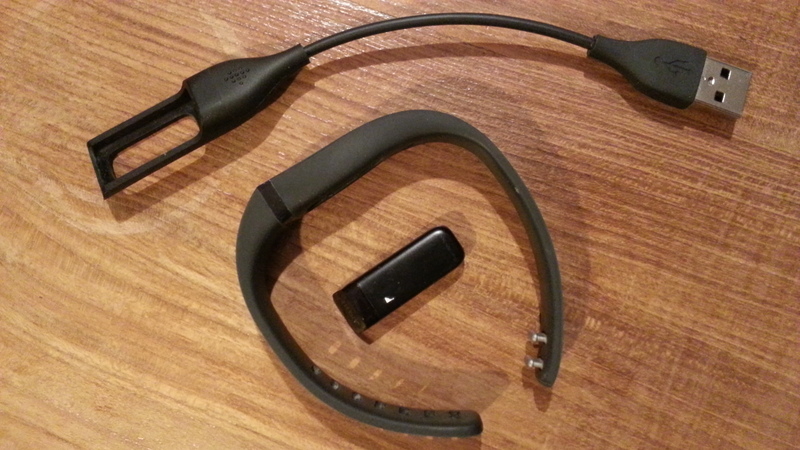 At that time the Jawbone Up was unavailable (even in the USA) and the Nike Fuelband couldn’t track my sleep. Basically the One is a pedometer (it tracks the number of steps you make per day) but also the number of floors climbed and the time asleep. Note you have to tell your device when you go to sleep and when you wake up ; it will substract automatically the times you were awake. The rest of the data presented are taken from these few observed variables: distance traveled, calories burnt, … The Fitbit website also categorizes your activity from ‘sedentary’ to ‘very active’. Of course there is an app (for both iOS and Android) where you can also enter what you eat (it automatically calculate the number of calories ingested) and your weight (unless you buy a wifi scale from them). You can set goals on the website and then it tells you how many steps you have to make per day. All this data is stored on a Fitbit server and you can access it via your personal dashboard (yes your data is kept away from you but there are ways to get it …). I liked the Fitbit One mainly because it is easy to use: you take it and forget it, it works in the pocket. There is a nice, easy to use web interface – great for immediate consumption (not really for long trend analysis). It is quite cheap to acquire the device (well, it is quite small anyway). It works with desktop software as well as mobile app (incl. synchronisation). The One can easily be forgot in a pocket (gives peace of mind) but it doesn’t work when you don’t have pockets (shower, pyjama, changing clothes, … ; I didn’t use the clip/holder at the waist). First it’s a proprietary system: you need to pay 50USD in order to get the data you generate, to get your data. Although it makes perfect sense from a business perspective, the device then costs 150USD (and not only 99USD for acquisition alone). Then it also uses a proprietary interface to charge the device. This is problematic when you move house (the cable is somewhere in a box) or simply when the cable is lost (see messages on Twitter asking for such cable when lost). Most mobile phone manufacturers understood that and provide regular USB interface (for charging and syncing btw). I guess the small form factor has a price to pay. Tracking of other activities than movement is tedious, especially the need for an internet connection in order to enter food eaten in the app (but otherwise that’s the drawback of logging: auto-vs-manual in general). Then tracking is sometimes not practical. e.g. between wake up and dressed up or shower. So is there always some under-reporting? Probably there is as I don’t wear it when changing or in pyjama (no pocket). Of course the One comes with an armband-holder but I guess it records data differently. But the last and main disadvantage that comes to my mind is linked with its advantage: it is so easy to use and to forget (in the washing machine), it can fall and you won’t notice it. So of course I lost it. It was in a business trip in South-East Asia. I thought I put it in my suitcase when changing pants but I couldn’t find it anymore. So after a few hesitations I chose to get a Fitbit Flex. The Flex comes in another format: it’s like a small pill that you put in a plastic armband-holder. Therefore it is closer to the body (but not legs, to count steps) and therefore you don’t need pockets. However it doesn’t give time (if you have a watch you’ll have 2 devices at your left wrist? Fitbit now sell an evolution of the Flex – the Force – with LEDs displaying time a.o.). As it is always in its armband I feel it is less likely to be forgotten. And you don’t need pockets, it’s like a bracelet you receive at some concerts. The battery autonomy is approximately the same: around 7 days. You can read here another comparison of the two. use the Fitbit API and figure out how to get my data out it. Of course I chose the third option. It is a bit more complicated but helped with one of Ben Sidders’post I started coding my “app” in R, the statistical language. 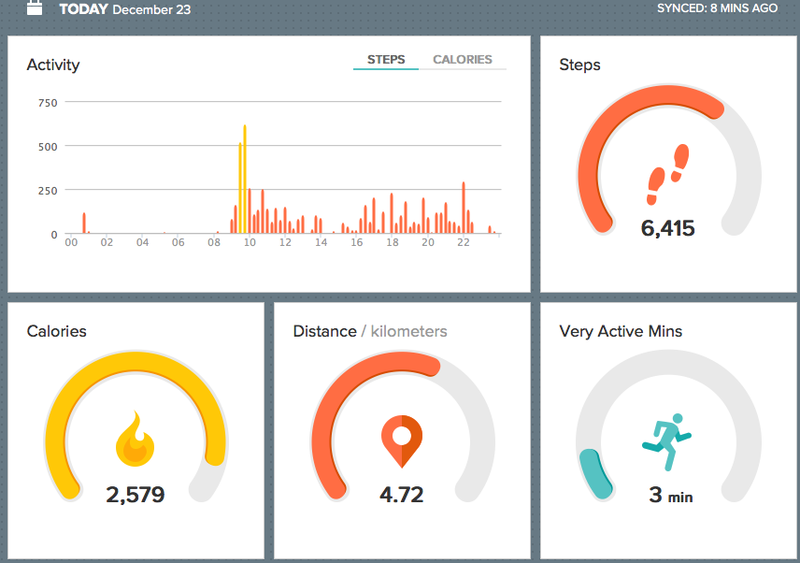 As there is a bit more than Ben is explaining I posted all my code on the Github repository of my app, jepsfitbitapp. The first thing I wanted to see is the most obvious one: my steps. As you can see in the figure below I started to collect data in March 2013 (with the One), I stopped collecting data around October 2013 (when I lost the One) and I re-started later on (with the Flex). I usually walk between 5,000 and 10,000 steps per day, with a maximum on July 1st (the day we moved). 10,000 steps is the daily goal Fitbit gave me. 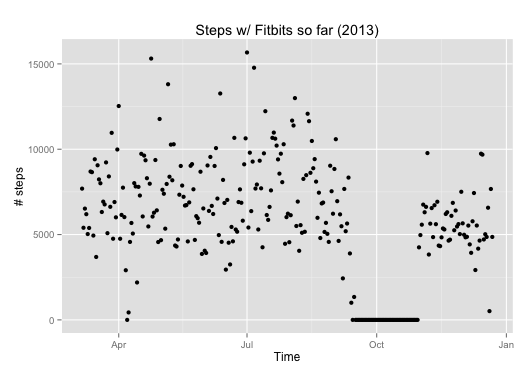 There is a significant difference in the number of steps measured by the One (before October) and the Flex (after October): I cannot really say if it is due to the change in tracking device (and their different location on the body) or if I kind of reduced my physical activity (mainly because of more work, sitting in the office). As always, I’ll promise to add some physical activity on top of this baseline as a New Year resolution. We’ll see next year how things evolve. In the meantime I’ll explore more what I can extract from my Fitbits in the following posts. Stay tuned! I started to use the R package rworldmap because it seemed the most appropriate for this task. Everything went fine. Most of the time was spent converting the list of countries from plain English to plain “ISO3” code as required (ISO3 is in fact ISO 3166-1 alpha-3). I took my source from Wikipedia. I should have better simply read the documentation: there is another small command that needs not to be overlooked, rwmGetISO3. What are the three codes that failed to match? A few posts ago I wrote about my discomfort about stacked bar graphs and the fact I prefer to use simple table with gradients as background. My only regret then was that the table was built in a spreadsheet. 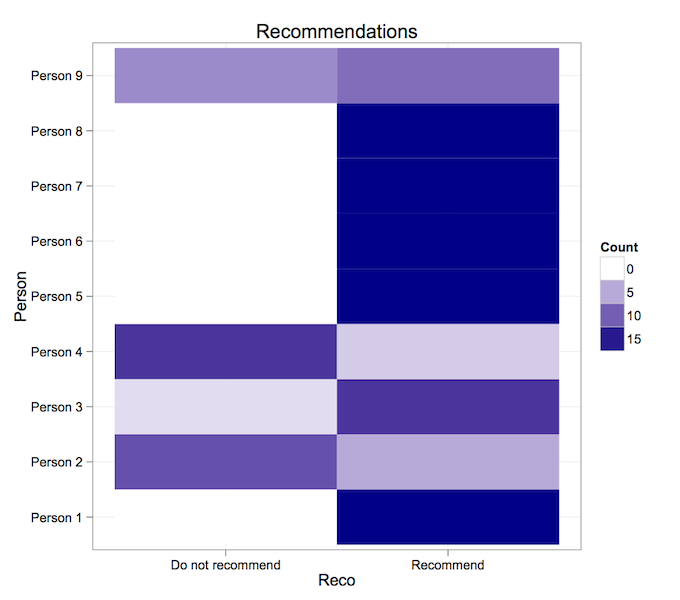 I would have liked to keep the data as it is but also have a nice representation of these categorical data. This evening I spent some time analysing results from a survey and took the opportunity to buid these representations in R.
How do you think these persons were, last year? Possible answers were: very bad, bad, average, good or very good. Would you recommend these persons for next year? Possible answers were just yes or no. Easy isn’t it? 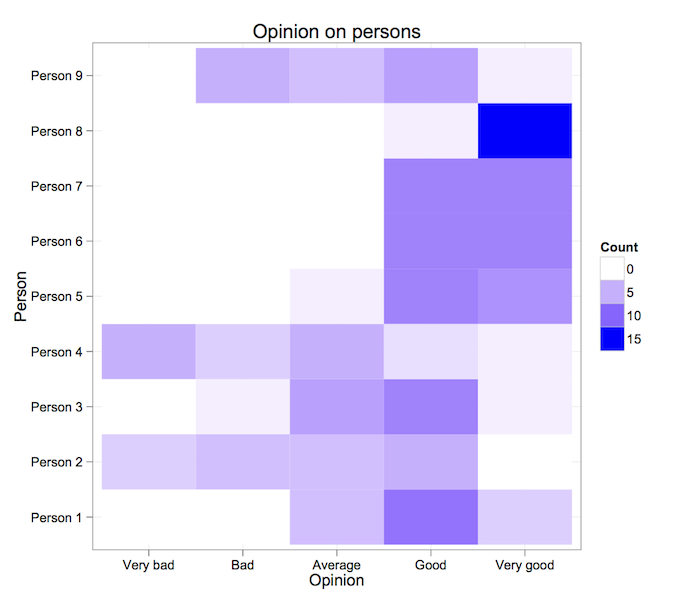 Do you have other types of visualization for this kind of data? Adapt the path to your R version, change the string “proxyaddress” by your proxy (see this previous post for a tip on this) and you’re done! Finally, here is a R reference card that can be useful too.